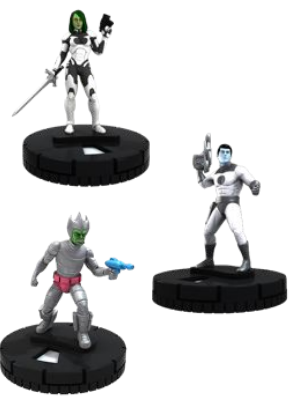 Wizkids Announce Guardians of the Galaxy Heroclix Tie-Ins, including Inhumans! Wizkids has announced the Heroclix releases that’ll tie into the upcoming Guardians of the Galaxy movie. There’s lots of awesome here, so we’ll break it all down. In July, Wizkids will release Marvel HeroClix: Guardians of the Galaxy which are products based on the movie. Out July 2, is the Guardians of the Galaxy Movie Starter Set. This set will feature six new figures with all-new dials, two maps, the Heroclix core rulebook, the Heroclix Powers and Abilities card, and tokens. This set will get you ready to play. Out the same day is a gravity feed display. That set features five figures unique to the set, and breaks down with 8 common figures, 4 core-hobby exclusive rare figures, 1 core-hobby exclusive chase figure. If that’s not enough Guardians of the Galaxy for you, in August, there’s more releases, but these are based on the comic book! Booster bricks will feature all of the Guardians but also figures based on the Badoon, Kree, Dire Wraiths, and more! The Marvel Zombie theme continues with villains hidden in boosters. This set includes 80 all-new figures with 24 common (plus one Prime figure), 17 uncommon (plus one Prime figure), 16 rare (plus one Prime figure), 12 super rare figures (plus one Prime figure), and 8 Marvel Villain Zombie chase figures. There’s a Fast Forces Pack, Marvel HeroClix: Guardians of the Galaxy “The Inhumans” Fast Forces Pack, bringing the Inhumans to Heroclix. The set features Black Bolt, Medusa, Crystal, Karnak, Gordon, and Lockjaw. That’s 6 figures with all-new dial designs, two exclusive maps. Also coming out is a Gravity Feed set. This one features 10 figures with flat rarity and all-new dial designs. The set includes members of the Guardians of the Galaxy, as well as threats like the Badoon, the Kree, and more! Finally, there’s an Organized Play kit. These help stores put together weekly events for stores and aren’t for sale. The set feautres 12 limited edition figures, three copies of four characters. There’s also 20 3D objects, of which there’s 10 copies of 2 different objects. Finally, there’s three limited edition Marvel Zombie Villains Team Bases for use with the Marvel Zombie Villain figures found in both Marvel HeroClix: Deadpool and Marvel HeroClix: Guardians of the Galaxy. Finally there’s 10 2-sided maps and 1 organized play instruction sheet. That’s a whole lot of awesome for fans of Marvel’s Guardians of the Galaxy!